Analog Artist Digital World: The Jungle Book opens April 15th. I went to a preview screening of Disney's, The Jungle Book at The Regal Winter Park Village Stadium 20. The Florida Film Festival was going on at the same time and because of that, the preview audience was let into the the am earlier than usual before the screening time. 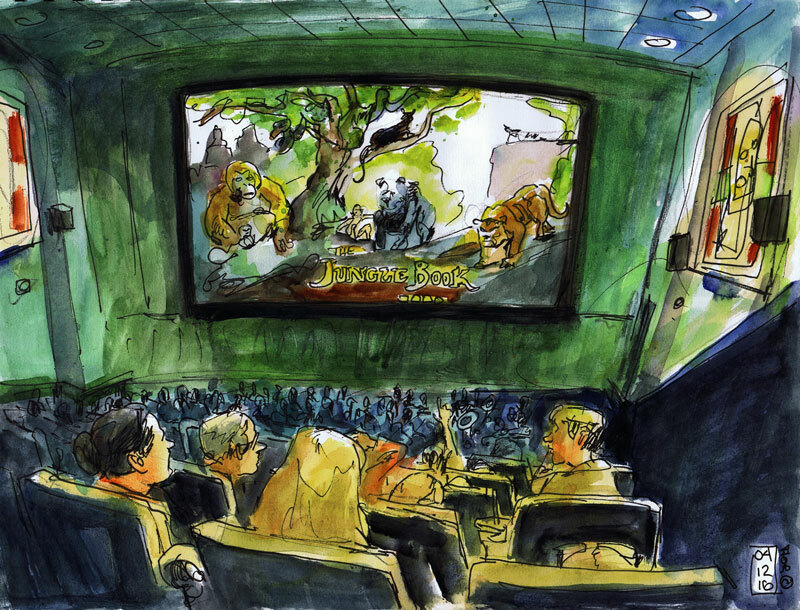 When I was young, I saw drawings from the original Jungle Book movie on display in a mall in New Jersey. The drawings were fro a scene in which the menacing tiger Shere Khan gets up and walks back into the forest. The drawings were awe inspiring and they lead me to want to someday animate for Disney. That dream eventually came true and [ got to work beside some of he best draftsmen in the world. When digital films took over the need for hand drawn animation disappeared. Since The Jungle Book played such a pivotal roll in my boyhood dreams and aspirations, I was excited to see this new adaptation. Quite honestly I expected it to fail miserably. In the opening sequence, Mogli is running through the jungle being chased by an unseen predator. The jungle glowed warm and was a character in it's own right. The second an animal spoke I groaned. Cute wolf cubs seemed like an overly saccharine sweet touch. But then the stony tool hold and the talking animals grew on me. Baloo the bear was played by Bill Murray. The voice stopped me in my tracks until [ could place it. Then Bill breathed new life into an already lovable character. I was shocked when tears welled up as Baloo told Mogli, that he didn't want him around anymore. Of course the big bear was lying, he had become emotionally, attached to the boy, but Bagheera the panther had convinced him that the man village was the best place for the boy. The film was astonishingly dark and real. Mogli always had scrapes and scars from the jungle. The scene that showcased the monkey king reminded me of a scene from Apocalypse now in which Marlon Brando rubbed his bald head with cold water. Louie, the monkey king and Sher Khan were both incredibly menacing characters. Some children were crying in the theater, Yet it is precisely this brute force that makes this film a true classic. I was blown as by it's power and majesty. I was swept away by the mythos of a young boy finding his way alone in a cruel world. Friends help in times of trouble. I can not recommend this film enough. It opens in theaters nation wide on April 15th.